Happy Wednesday, my fellow foodies! I hope your weekends were full of friends and fun. We had a full apartment Sunday for a Fantasy Football Draft party. Now, I’m not a huge football fan, but I am a fan of football food. Pizza, wings, sandwiches, buffalo chicken everything, and ALL of the dips… spinach artichoke, guacamole, salsa, layered taco, hummus, queso…I could go on and on. On Sunday, I wanted something really easy that could be make in the crock pot. Sunday: the day of rest and crock pots. Yes! So, I made a giant batch of pulled pork to spoon inside of little slider buns, my perfect original coleslaw, and an angel food cake with strawberry coulis and whipped cream. All were a hit. Aren’t crockpot meals the BEST for big crowds? I mean, when I have people over, I don’t want to be stuck in the kitchen. Don’t worry, I will be sharing these football Sunday recipes soon. 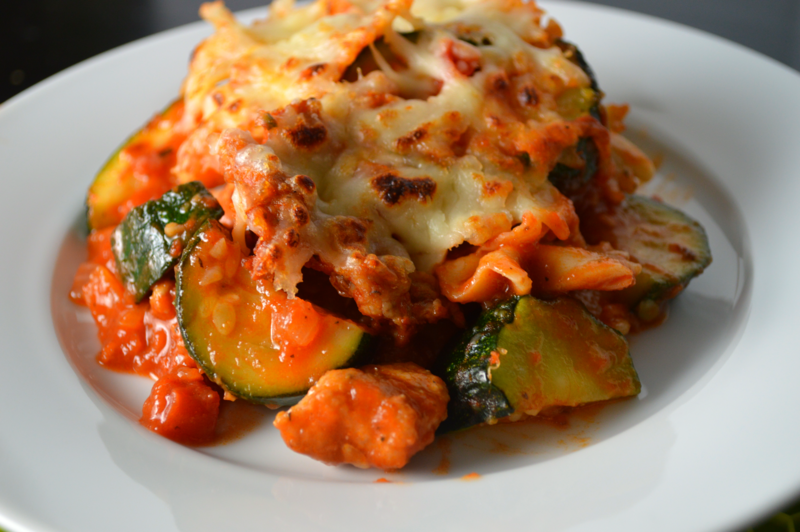 Onto the main event today….this incredible Zucchini and Chicken Sausage Pasta Bake.I know it isn’t the prettiest plate I’ve shown you, but it is so freaking good, once you take a bite you’ll forget all about that… pinky promise. It’s also the perfect dinner for this chillier weather we’ve been experiencing this week. 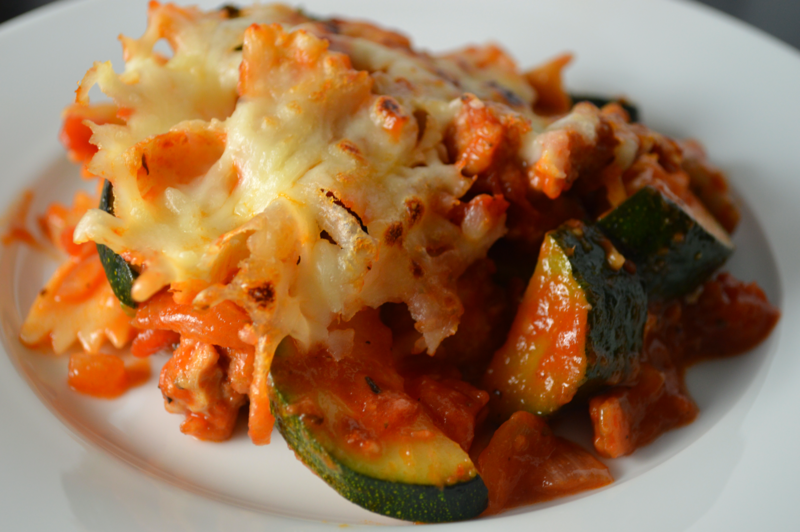 Curl up with a bowl of Zucchini and Chicken Sausage Pasta Bake and turn on your latest Netflix addiction. I’ve currently been binge watching Fringe. I’m completely fascinated with the relationship between Dr. Bishop and his son. Anyone else? Fringe reminds me of Supernatural meets a cop thriller. Check it out if you’re into that kind of thing. This pasta bake is also a lovely option for when you have company and don’t want to spend the entire night in the kitchen. 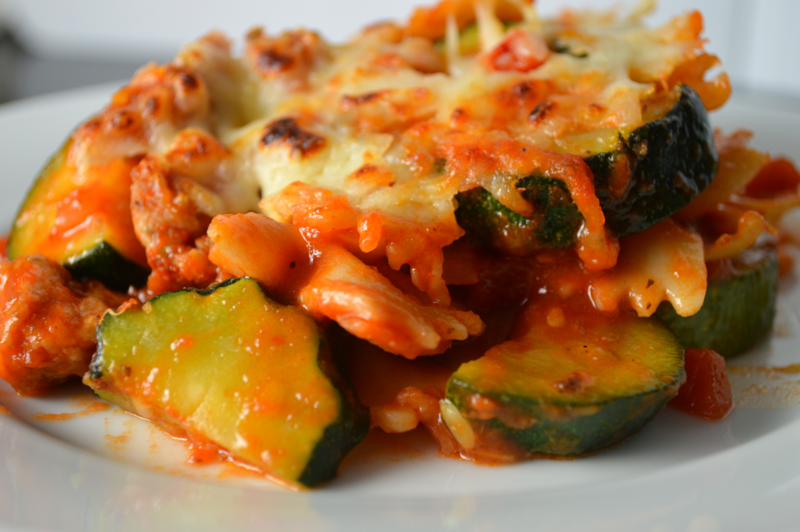 In this recipe, I brown zucchini with chicken sausage, onions, garlic, and tomatoes. Then top the entire pasta toss with cheese and broil until golden and bubbly. That is simple enough. However, if you wanted to, you could put the pasta toss together before your guests arrive. Then, a couple of minutes before you want to eat, pop it under the broiler to melt the cheese. There you have it, melty, cheesy, pasta-y goodness. Boil the pasta one minute less than the package instructions. In a large skillet, saute the chicken sausage on high until golden brown. Remove from pan. Add a drizzle of olive oil to the pan, if needed. Lower heat to medium. Add the onions and a pinch of salt and saute 3-5 minutes until slightly softened. Add the zucchini and sauté on medium high heat for about 3-5 minutes until lightly browned. Season with salt, pepper, Italian seasoning, and red pepper flakes. Return the sausage to the pan. Add tomato puree, diced tomatoes, and pasta. Cook until heated through. Transfer the pasta into a dish sprayed with cooking spray. Top with cheese. Broil on high until the cheese is bubbly and golden brown. As Ali’s personal food critic, this is one of my favorite dishes! I can’t wait to give this recipe a try. Look’s easy and delicious! Beautiful pictures Ali!